Found this while scouring the internet today. If you know the Geek than you know this is relevant to my interests on more than one level. If you don't know the Geek, well, it's funny. Hahaha. Funny stuff. 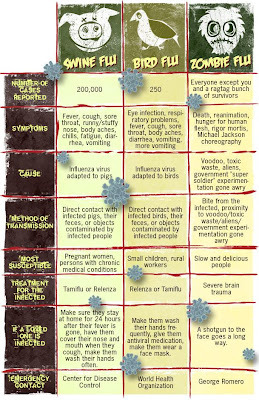 At any rate, I now present to you a handy comparison chart for all the different flu viruses you might encounter this season. If anyone out there has the legit source for this image, I'd be happy to link them here. As always, leave your comments below, the Geek is sure to answer.